1968 Fiat 124 Coupé - There aren't many of these around anymore. Most rusted away or, because they were coupés and not roadsters, were used for parts. I always liked the looks of these cars. This one is in restorable condition. The seller says it has its original paint. If that's true and there's no Bondo hiding anywhere, this car doesn't appear to be too rusty (by Fiat standards). The engine and transmission are out of the car, so I would assume one or both need rebuilding. (Why else would they be out of the car?) It looks like this car has air conditioning (which probably never worked), which was a fairly rare option. It may be better and cheaper to buy a restored 124 Coupé, but if you're a DIY kind of person, this car may be a good buy. Located in Carnation, WA, click here to see the Craigslist ad. 1999 Isuzu VehiCROSS - Oh boy. I'm in trouble. I can think of at least two friends who, when they see this post, are going to give me hell. (One, fortunately, is without out an internet connection for a few days, so I won't get blasted right away.) What can I say? I like these things. 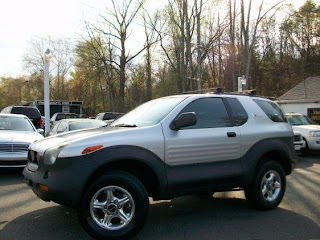 The VehiCROSS was a 1993 Isuzu concept vehicle. It was released to the public in 1997, with very few changes. Offered until 2002, less than 6,000 were built. It featured a 4-wheel drive system Isuzu called "TOD (Torque on Demand)", which gave it incredible traction on and off road. While the body was futuristic, the rest of the truck was pretty much run of the mill Isuzu. Located in Stafford, VA, click here to see the AutoTrader.com ad. 1986 Porsche 928S - This is another one of those cars that makes me scratch my head... It has just 6600 miles on it. How can you buy a car like this and drive it less than 275 miles per year? This 928S is a lot of car for a lot of money. Personally, I'd buy one with more mileage for less money, but if you're looking for a "new" 1986 Porsche 928S, this may be your only chance. The FIAT 124... I really like the older Fiat's, 850's, and that Euro only 130 Coupe, but I can't get too excited about this one. Maybe it's because I remember the appearance of the last straggling survivors in the 80's. They looked like hell. Sometimes ones overall memory of a particular car is affected by the condition of the last running example you ever saw. I saw an X1/9yesterday. It was painted "rat rod" flat black and had some bright red spray can touch ups on assorted body parts. It looked like crap. The ISUZU. Last summer I saw a VehiCROSS gliding through a supermarket parking lot. It was striking to say the least. Following the demise of the VehiCROSS, I remember car magazines being filled with newly coined crossover concepts, such as "fun activity vehicles," that were essentially variations on the VehiCROSS theme. I don't remember Isuzu getting too much credit from automotive journalists. On the other hand, Isuzu never seemed to capitalize on it at all. When they launched the Axiom, a decent looking vehicle, they brought the Joe Isuzu character back out of the closet. Big mistake. While the whole "Joe" thing was memorable, I'm not sure it helped the Isuzu image. GM would have been better off milking the Isuzu Lotus connection which gave us (yeah, the FWD...) New Elan. Yeah, GM also launched the Catera with a cartoon duck, Ziggy, and "the Caddy that Zigs." Try Googling "Catera" and "duck logic" together. I kid you not. Who wants to see a liar spokesperson make jokes on TV when you've just spent a fortune getting your Trooper to pass inspection? Porsche 928. It's obvious that the ultra low prices of the bottom of the barrel examples are dragging down values of the clean low mileage 928's. Folks think, "Is that all it's worth..." and so on. There are quite a few low mileage and well sorted 928's out there that have spent most of their life in a garage. There are 928 owners out there who are every bit as fanatical and meticulous as any "air cooled" Porsche owner. This is pretty obvious by reading their detailed listings on ebay and elsewhere. The scorn of the airhead Porsche "purist" community does not help matters at all. Just look at the values of water cooled 996 models from 1999-2001. Low mileage examples are changing hands for $20K or less.